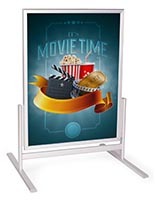 This Sidewalk Sign is has Snap Frames For Quick Poster Changes! This Sidewalk Sign is Weather Resistant! 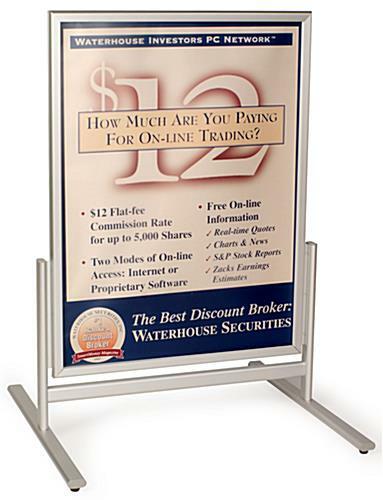 Use this sidewalk sign indoors or out to exhibit images, media content, sales or specials. 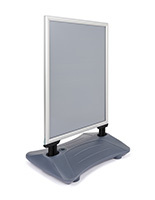 Each sidewalk sign, message board is durable enough to endure moderate winds, but should not be utilized in severe weather. Like all outdoor displays, this sidewalk sign should be left outside with discretion. 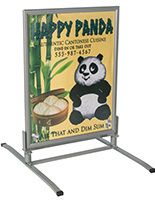 This sidewalk sign provides a perfect method to attract awareness, and draw business into your store. 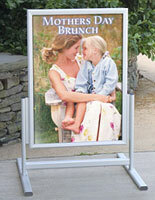 A sidewalk sign, likewise recognized as an a-frame sign, is perfect for storefronts, patios, and entryways. 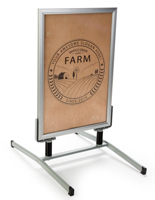 This sidewalk sign incorporates a rugged, brushed aluminum construction that is weather resistant for outdoor use. 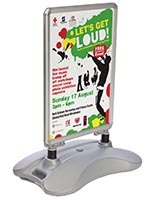 Snap open edges enable you to exchange posters in minutes, while a lightweight design assures easy transporting. 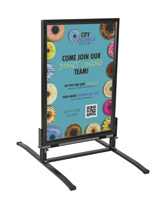 This sidewalk sign is a double sided display that accommodates two 30" x 40" posters back-to-back. 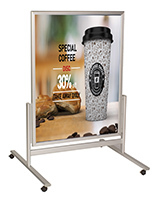 Your images are sheltered by non-glare, clear PVC lenses.